Posted on September 24, 2018 at 11:48 am. Photo courtesy of Essex Park Mural Project. 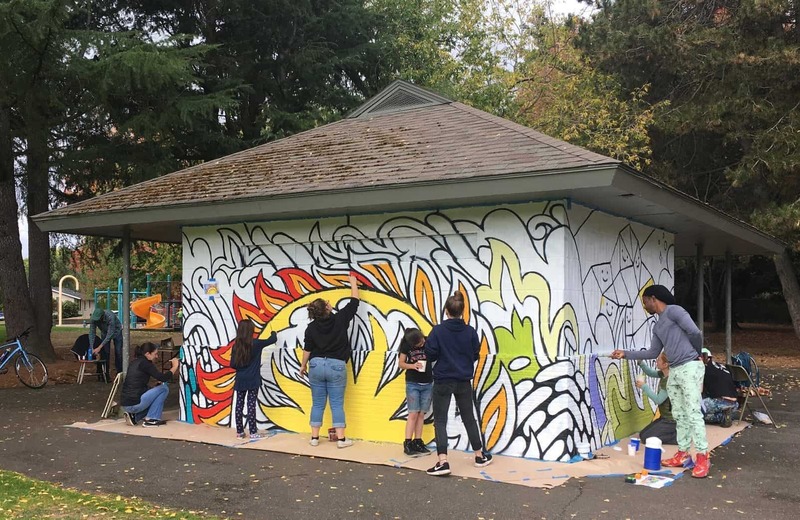 If you’re around the Foster Powell Neighborhood in Portland, you may have caught a new mural going up at Essex Park on SE 76th and Center St. during the weekend of September 22 and 23. 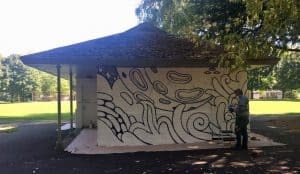 Artist team Rather Severe (Travis Czekalski and Jon Stommel) is heading the mural painting, with design and painting help provided by the Foster Powell Neighborhood Association and Marysville School students. After some public safety issues in the past, neighbors of Essex Park came together to find ways to “re-establish positive and uplifting energy and encourage more positive and healthy interactions between community members who use the park space”. They started a GoFundMe campaign earlier this year, reaching their original goal, and later received matching funds from RACC to support the project. While the original plan was for the mural to be painted on one wall of the public restroom building, the financial success of the campaign meant enough funds were available to paint all four walls. The design consists of a vibrant Sun on the front facing wall, Moon on the back wall, and imaginative landscapes with characters in between. The landscape design elements move consistently in a clockwise, upward spiraling motion, symbolizing growth, movement, and uplifting energy. The characters in the mural aim to communicate and encourage the idea of mindfulness, the practice of meditative drawing, feelings of interconnection, and the concept of an ever present and infinite ‘now’.